Joyce Quaweay, left, 24, was beaten to death in the Germantown home she shared with her then-boyfriend, Aaron Wright, top right, and his friend, Marquis Robinson. Both men are former Temple University police officers. 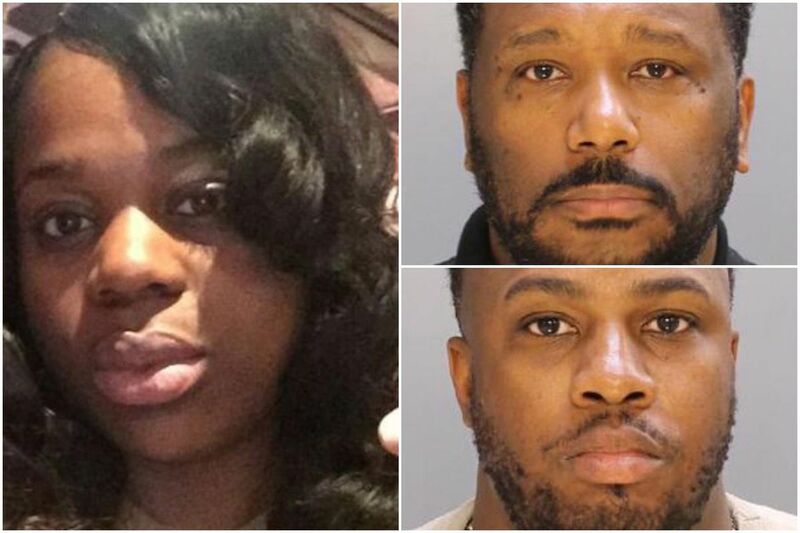 Former Temple University police officers Aaron Wright and Marquis Robinson created a "degrading, diabolical torture chamber" in their Germantown home, where they beat Wright's girlfriend to death, a prosecutor said Wednesday as she snapped open a police baton. "She was handcuffed, naked," Assistant District Attorney Chesley Lightsey said of Joyce Quaweay, 24, who had been bound at her wrists and ankles as she lay facedown on a weight bench in the kitchen of the home she shared with the men, Robinson's girlfriend, and various children. "They were taking this, and coming over their head, and beating and beating and beating Joyce," the prosecutor said loudly in her closing argument at the two men's nonjury trial, holding the baton above her head and repeatedly swinging it down. Soon after Lightsey finished, Common Pleas Court Judge Diana Anhalt convicted Wright, 49, and Robinson, 43, on all charges — third-degree murder, conspiracy, and related offenses — in Quaweay's July 29, 2016, beating death, and set sentencing for July 20. A Temple spokesman Wednesday said Wright joined its police force in 1989, but he declined to discuss the circumstances of Wright's 2012 resignation. Robinson joined the force in 2006 and was fired after being charged with murder, the spokesman said. Lightsey didn't cite a specific reason for the deadly beating. But she painted a picture of the two men as controlling and physically abusive of the women and girls who lived with them. They were regularly beaten for "not following the rules," the prosecutor said. A 12-year-old girl testified Tuesday that she had witnessed Wright and Robinson beating Quaweay with a police baton on that deadly July day. She also said that she had been beaten and handcuffed by the two men and had seen Robinson's girlfriend being beaten. Once, she said, Wright ordered her to a weight bench to be beaten because after she cleared his plate from a table, she didn't put the napkin in the trash, instead leaving it in the sink with the plate. The girl, who was 10 in July 2016, and her younger sister, then 6, had at times stayed in Wright's home when their mother, Wright's ex-girlfriend, worked nights. On Wednesday, the mother of the two girls testified about what she saw that morning when she went to pick up her daughters. The Inquirer and Daily News are withholding her name to protect the privacy of her daughters. "I seen Joyce," the woman testified. "She didn't have any clothes. She was laying on the floor bruised." But the woman, speaking in a low, matter-of-fact voice, didn't seem to want to answer some questions. That's when Lightsey read parts of a statement the woman gave to police that day. In it, the woman said Wright told her that Quaweay had pulled a gun on him and had taken money that he wanted for a haircut. He also told her that Quaweay hated her and didn't want her children in the house, the statement said. In court, the woman testified: "Whatever happened that morning, I guess she [Quaweay] didn't comply." James Berardinelli, Wright's attorney, and Gary Server, Robinson's attorney, argued that the two men did not commit murder, contending that Quaweay died of heart failure. The judge disagreed.